Dr. Iverson graduated from the University of Minnesota in 2003 with a bachelor of science degree. She performed her graduate work in biomedical engineering at Rutgers University, The State University of New Jersey, earning a master’s degree in 2005 and Ph.D. in 2010. 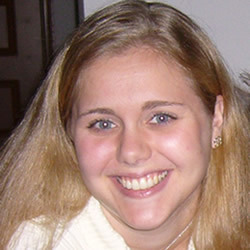 Nicole joined Dr. Wogan’s research group as postdoctoral fellow in April 2010. Nicole’s main interests are nanotechnology and translational technology, propelling research from the bench top into animal models. In her graduate research Nicole studied a nanoscale macromolecule that binds to scavenger receptors and decreases internalization of foreign particles by macrophage cells through competitive inhibition. Through optimization of size, charge, architecture and drug encapsulation Nicole was able to obtain exciting in vivo results using the nanopolymer as a cholesterol-inhibiting, anti-inflammation treatment and participated in submission of a patent application based on her work. Nicole is utilizing her nanotechnology background in attempting to devise an in vivo model utilizing single walled carbon nanotubes that act as small particle sensors. Nicole’s current project involves a collaborative effort among the Wogan, Essigmann and Strano groups, with a goal of coupling toxicology, chemical and chemical engineering expertise to create novel technology as well as the possibility of eventual translation into the medical field. Moghe PV, Uhrich KE, Iverson N, Plourde N, Wang JZ. Compositions and Methods for Treating Cardiovascular Conditions. PCT International Patent Application: 08/077247. Filing Date: September 22, 2008. Nicole Iverson, Sarah Sparks, Nicole Plourde, Gary Nackman, Kathryn E Uhrich and Prabhas V Moghe, Decreased Cholesterol Influx and Increased Efflux through Nuclear Delivery of Liver-X Receptor Ligand by Anionic Nanoparticle Encapsulation. Biomaterials In Press. Nicole Iverson, Sarah Sparks, Kathryn E Uhrich and Prabhas V Moghe, Polymeric Nanoassemblies for Inhibition of Cellular Uptake of Oxidized Low Density Lipoprotein: Effect of Size, Charge and Architecture. Acta Biomaterials 6 2010 3081-3091. Nicole Iverson, Nicole Plourde, Evangelia Chnari, Gary Nackman, and Prabhas V Moghe, Convergence of Nanotechnology and Cardiovascular Medicine: Progress and Emerging Prospects. BioDrugs 22(1) 2008 1-10. Jinzhong Wang, Nicole Plourde, Nicole Iverson, Prabhas Moghe, and Kathryn Uhrich, Design of nanoscale macromolecules for differential display of anionic groups toward inhibition of cellular uptake of oxidized low density lipoproteins. Int. J. Nanomed 2 (4) 2007 697-705. Jianyi Zhang, Guangrong Gong, Yun Ye, Tao Guo, Abdul Mansoor, Qingsong Hu, Koichi Ochiai, Jingbo Liu, Xiaohong Wang, Yarong Cheng, Nicole Iverson, Joseph Lee, Arthur HL From, Kamil Ugurbil, and Robert J Bache. Nitric Oxide Regulation of Myocardial O2 Consumption and HEP Metabolism. American Journal of Physiology, Heart and Circulatory Physiology 288: H310-H316 2005. Copyright © 2003 Gerald N. Wogan, Ph.D. All Rights Reserved.